Intraoperative dorsomedial‐plantarolateral oblique radiographic projections of a slab fracture of the third tarsal bone. a) Percutaneous needle markers are placed in the centrodistal and tarsometatarsal joints on the dorsolateral aspect of the limb between the long and lateral digital extensor tendons. A spinal needle is placed between these needles to determine the site and trajectory of screw placement. b) A 2.5 mm drill sleeve inserted into the glide hole. c) Completion of the fracture repair with a 3.5 mm cortex screw. 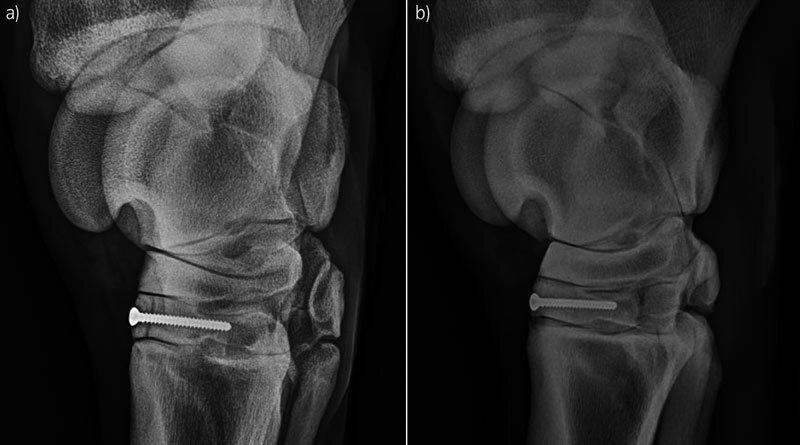 From Slab fractures of the third tarsal bone: Minimally invasive repair using a single 3.5 mm cortex screw placed in lag fashion in 17 Thoroughbred racehorses. Advances in imaging to manage fractures in horses in the past 10 years have brought major breakthroughs to help to identify causes, support prevention and improve fracture outcomes. Fractures are a common occurrence in horses of all ages and breeds and a collection of articles on the topic has been made available for free online by the Equine Veterinary Journal’s (EVJ), with an introduction from imaging expert Renate Weller, new president of the British Equine Veterinary Association. EVJ editor Celia Marr said the articles highlight the current scope of diagnostic imaging for a range of equine musculoskletal conditions. Medial intercondylar eminence of the tibia (MIECT) fractures are also usually associated with a traumatic event concludes the study Fractures of the media intercondylar eminence of the tibia in horses treated by arthroscopic fragment removal. Rarely reported in horses, they need prompt diagnosis and arthroscopic removal of the fracture for the best prognosis. Post operative dorsomedial‐plantarolateral oblique radiographs of the fracture illustrated in Fig 1. a) Eight weeks post surgery. The fracture gap remains evident but there is improved density in the fracture fragment. b) Sixteen weeks post surgery demonstrating continued fracture healing and improved osseous infrastructure. From Slab fractures of the third tarsal bone: Minimally invasive repair using a single 3.5 mm cortex screw placed in lag fashion in 17 Thoroughbred racehorses. Increased subchrondral bone plate thickness at the parasagittal groove can be a useful indicator of lateral condylar fracture, concludes the study Can we use subchondral bone thickness on high-field magnetic resonance images to identify Thoroughbred racehorses at risk of catastrophic lateral condylar fracture. However, high-resolution peripheral quantitative CT does not specifically predict condylar fracture, concludes the study Can high resolution peripheral quantitative computed tomography imaging of subchrondral and cortical bone predict condylar fracture in Thoroughbred racehorses? This may be because there is a lack of clear distinction between the subchrondral plate and the trabecular bone and because measurement of the subchrondral bone thickness is complicated by adjacent palmar osteochrondral disease lesions.